William O’Connor yanked too hard on the fishing pole. The line snapped, and the fish swam away with it down the bubbling stream. Petulant anger caused him to throw the pole into the surrounding woods. He mumbled curses, since it was the third time this week the line had broken. “Tom O’Grady, the old cheat! Sold me bad line,” he said under his breath while kicking rocks into the water. When he was about to turn around to find his fishing pole, he paused. A rainbow glimmered farther downstream. Ripe reds, vibrant oranges, and brilliant blues lured him. Forgetting the pole, he jogged along the bank. Unlike most rainbows, this one didn’t skirt away from him. The colors swirled closer, but then he skidded to a stop behind a tree. “When Irish eyes are a’smilin’ down on me,” a tiny little man dressed in red sang. William clutched his chest to still his pounding heart. He spied a leprechaun, one of the wee folk. Blinking several times, he noticed that the sprite was still there. He quietly danced a little jig with a grin stretching across his face. 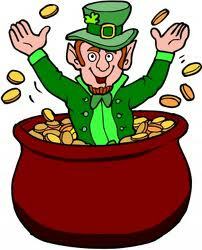 “I dance and sing so merrily.” The leprechaun twirled on his pot of gold. He rubbed his hands upon his brown trousers and wiggled his fingers. William O’Connor was going to catch him a leprechaun, he thought. Crouching down, he crept through the forest. Birds twittered and flitted through the air. The leprechaun continued his song. “And when I see a bonnie lass,” he sang. William stood behind him, waited a second, and then pounced. “Ack!” The leprechaun shouted and struggled, but William kept his hold on the little man. “I’ve got you now, I did,” he said, tightening his hold on the wiggling fellow. “Aye, I do.” Three wishes, wow! He didn’t know what to ask for, but he made no move to let go of the leprechaun. They were tricky buggers, and he didn’t want to miss out on his only change for wealth and happiness. “What do you want? Your first wish?” The leprechaun made no move to leave. A gleeful grin plastered itself to his face. A whole pot of gold, and it was all his. “Your second wish? I don’t have all day.” The leprechaun crossed his arms and glared up at him. “Really now? This is your final wish.” A gleam appeared in his beady eyes. A crackle of thunder split the air. The rainbow vanished along with the leprechaun. William O’Connor perched upon his pot of gold. He now wore a red suit and was no bigger than a small child. In his lap sat Elizabeth O’Leary’s left hand, a Claddagh ring attached to her ring finger. Awesome ending! Poor Elizabeth. Does she have no hand now? How could she play the flute? What a tricky little leprechaun. But I think the man was also kinda greedy. I'd have asked for a big publishing contract from Simon and Schuster. Is that greedy? Great story, Cherie. I always enjoy your tales. Reminds me of a saying, "Be Careful what you wish for, you just might get it." oops! the prior comment was me, logged in as my hubbie. Terri - Hehe! I thought the first comment there might've been you. Thank you! It is definitely about being careful what you wish for and how you word your wishes. Love the ending! That's awesome, Cherie.